A small porcelain container of square section, supported on a stepped base, with a flared shoulder and a straight neck. The square lid has a bird-shaped finial. The container is covered in underglaze blue designs. Two of the sides are decorated with an overall chequered design (ichimatsu), the other two sides have a key-fret pattern. The shoulder is decorated with a starburst diaper pattern and a band of key fret pattern runs around the neck. The porcelain vessel is contained within the original tomobako, inscribed Shonzui shiho furidashi, Kutani Seiseiken, Eiju-zo, with the seal Eiju (Motifs of auspicious patterns, pottery square pot for condiments, made by Eiju, Seiseiken kiln, Kutani ware). The potter of this charming Kutani-ware porcelain container is Yaguchi Eiju I (Kataoka Shigeo). It was made in the Seiseiken kiln. Yaguchi Eiju I (1870 – 1952) founded the Eiju kiln in Ishikawa prefecture by inviting potters from Kyoto who studied under Eiraku Hozen. Eiju I is known for his work in the style of Ninsei, Kenzan, sometsuke, and shonzui ceramics. 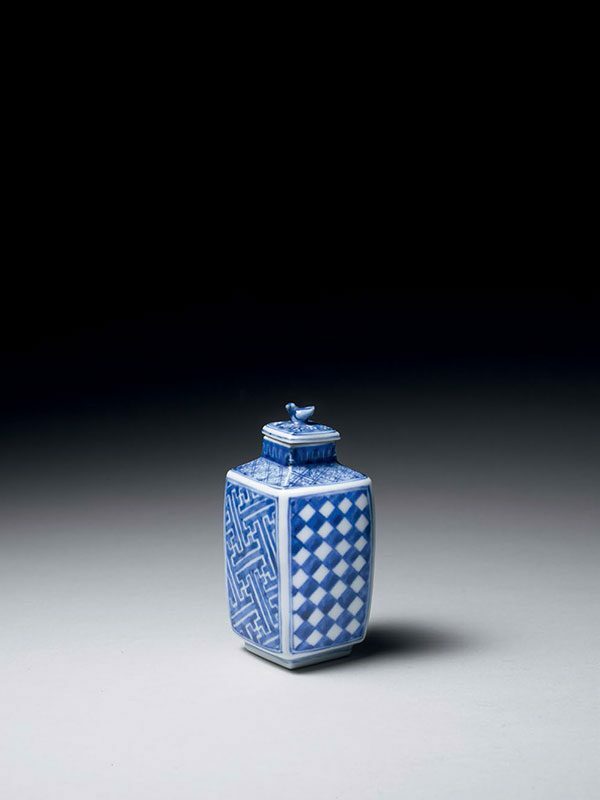 The development of Kutani-ware ceramic forms and decoration is closely associated with the tea ceremony, and this charming porcelain jar with its striking ichimatsu pattern was intended as a container for condiments.